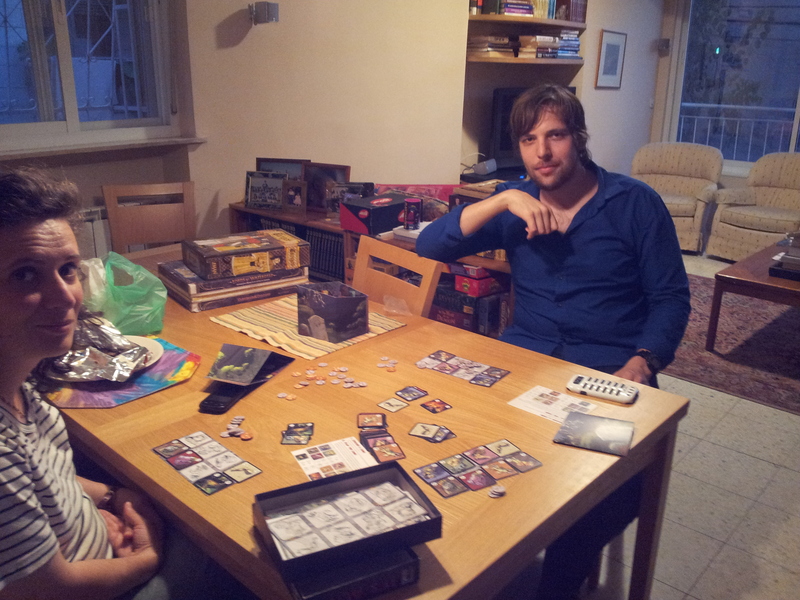 David and Nisan arrived a little early, so I tried this on them with only the basic cards. Using only the basic cards is necessary in order to have a hope of obtaining combinations, but the game is a bit flat. The special cards make the game less flat, but make the combinations more difficult. Perhaps picking from 6 and playing 4 would be a better game experience (instead of picking from 5 and playing 3). First play for everyone except for Gili. Gili was slightly ahead of me and then slightly behind me until the final counting, whereupon both David and Roman shot ahead by finishing their last three missions. I shot ahead with bonuses in both buildings and jewels, as well as a strong island showing. Bora Bora seems, after one play, to be, like Caylus and Die Macher, a well-balanced game that works, but is too complicated for its own good. It’s one thing to have 5 or 6 different interlocking mechanics, but this one has upwards of 15 of them, and only some of them make any thematic sense. The goods and buildings mechanism is the most strange, and the forced arrangement of storing goods the most unnecessary. So is the division between people into men and women. A few other games inhabit spaces close to this, such as Agricola, but somehow Agricola’s tight, sensible theme and limited decision mechanics squeaks it through. In Bora Bora, you get 18 actions during the game plus any actions on the people you acquire (up to two, one man and one woman). The actions are three dice to assign to seven different action options in each of six rounds. The value of your action is the value of your die (so higher is better), but you can only use an action if your die is less than the value of any other die already place on that action (so lower is sometimes better). But “gods” (we called them “dogs”) you acquire can let you get around that, but only if you also have offering tokens to use with them, unless you got a free dog action by having the highest priest value last round …. etc. Forget it, it’s too complicated. 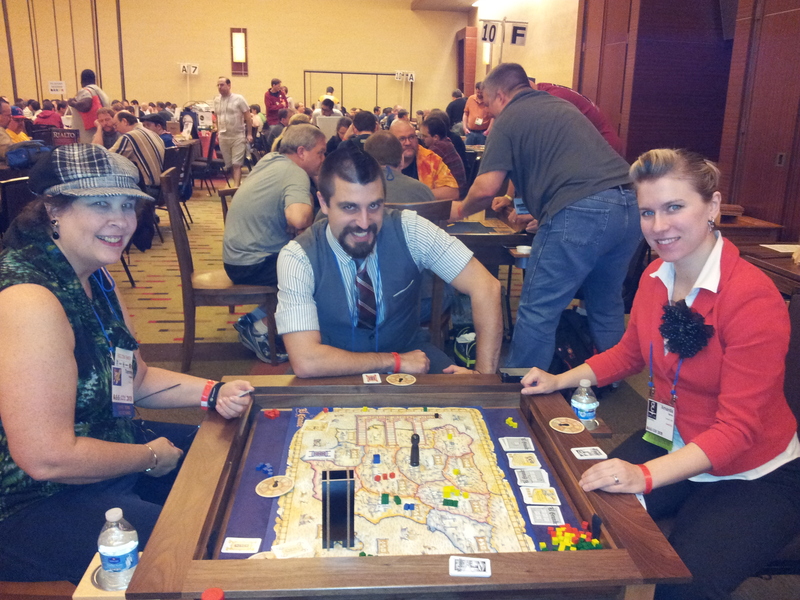 It was fun, because the game worked, there were many strategic paths, and the decisions were harrowing. But it was painful, because every move by every other player locked away actions that you desperately needed, so you watched your plans crumble, sometimes before you got to take a single action. I suppose that is true for every worker placement game; and even in this game, there is sometimes (but not always) a way to do something the long way that you couldn’t do the short way. I’m not sure yet. Perhaps experience will soften the frustration. One more thing: as typical with dice rolls and card flips, just a bit too much of one’s ability to progress is determined by how the order of the card flips favors one player over another. Before my first turn, I decided to take the bonuses in buildings and jewels, and that’s what I did. In order to achieve this, I was required to take 5 people, build 6 island spaces, and place 3 priests. I fulfilled 7 missions. Gili was sure that fulfilling 9 missions was the way to go, and that is what she did in her previous 4 games. In this game, either through the odd order that people and missions turned up, or through fierce competition, she was thwarted in every direction. Roman collected several items to move him up in turn order, but he only achieved full success in that starting from mid-game. Update: It turns out we missed a scoring rule: you get 6 points for filling up your building space (with buildings or with goods) and ANOTHER 6 points for using all of your buildings. This means that using all of your buildings automatically nets you +12 points (since it also fills your building space). So I actually have 6 more points. Similarly (although this doesn’t apply to any of us for the game we played) you get 6 points for using all of your huts and 6 points for filling all of the spaces with people; if you did the latter, you had to have done the former. Second number is just before second scoring to show I was ahead. Nisan took Score first place in all regions early on. 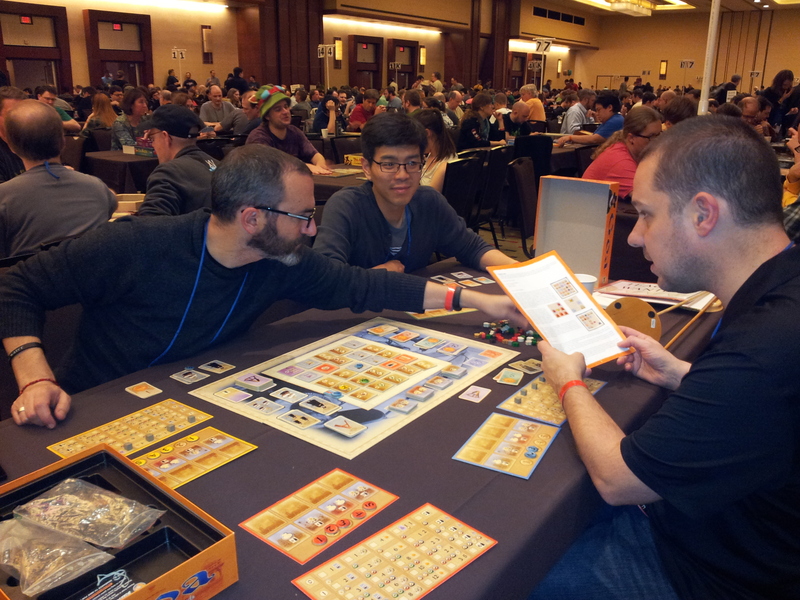 Special scoring was taken most rounds, Intrigue was taken more often than I expected – these guys were willing to think. I scored first place in the three 5 regions twice with special scoring. Binyamin G was good at remembering what was in the Castillo, except the last round. 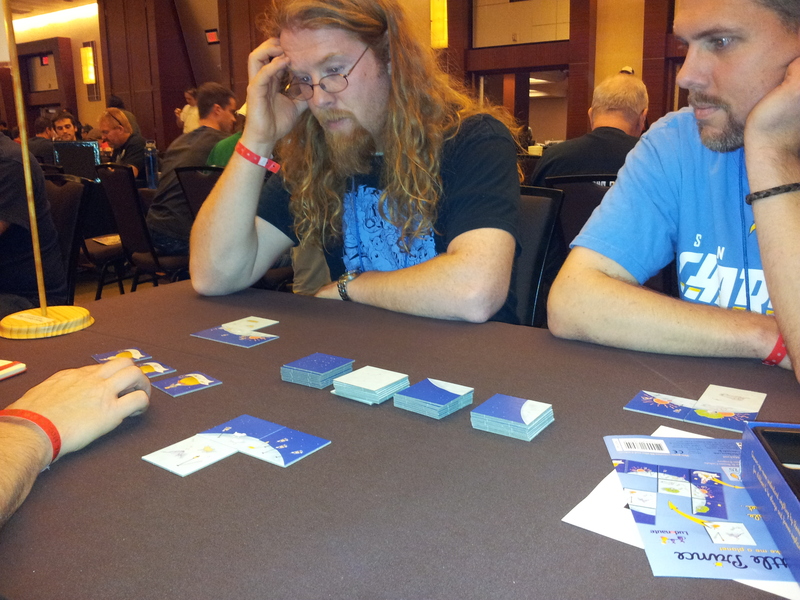 They discussed card selection and move options extensively, partly because they were both new to the game. We placed all our Caballeros, except Binyamin G had one left. 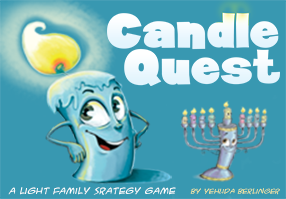 Binyamin G taught this game, which is similar to Thunderstone but simpler. You start with 50 life points, and buy cards and attack. I had over 20 points when I killed him. It’s nice for a quick two-player game. Mace arrived in Israel today from Australia via NY and Barcelona among other places, Shachar’s Masa Kumta is tomorrow, then he’s starting a commander course, he’s in search and rescue. Bill and Shirley returned from a wedding in the States and are off to China for another wedding, they’ll be back for games day. Lior is going to the States for Sukkot. Very close at the end. Lior did a good job, his first play. I made several mistakes including one which gave Gili a lot of points first round. A few mishaps and rules issues – if there are ties for both first and second place, does second place score. After a lot of discussion, we finally decided no, and moved people back for previous plays. Mace knocked over the castillo, fortunately at the beginning of a round with few pieces in it, but it disturbed the board. I had taken a picture of the score after the second scoring round, so we each scrutinized it to determine the colors and number of cubes in the regions, with the king blocking some. At the end of the second scoring round Gili and I were tied for first place, so we got attacked more, though Mace (brown) and Lior (yellow) were close behind. 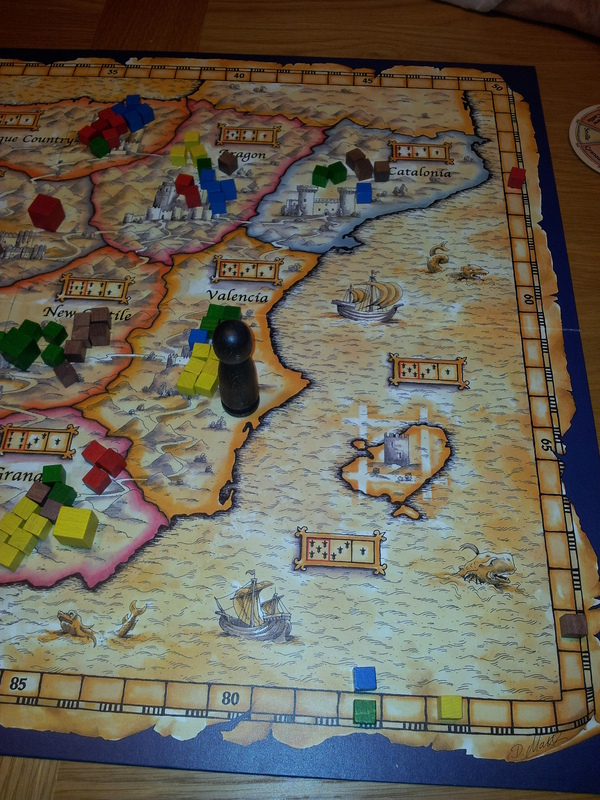 Lior had a large majority in Valencia with the high mobile scoreboard, then Mace took it to his province of Galicia. Mace also controlled a round with a veto. We had several choose regions to move to in the 8th round, everyone went into my Seville region. Per our house rule, we replaced the ‘take back a power card’ in the last round, though the card that came up, ‘move you grande’ wasn’t so useful either, but at least could have been. Eszter, Gili, Roie, Shalom, Nadine on a cold stormy night. Eszter, Gili and I played 3 rounds while waiting, I think I won one and Eszter two. It took a while to decide what to play, until we remembered our favorite 5 player game. New to Roie, and Shalom has only played twice. All the cards where you lose caballeros came out early which hurt me, Gili did the best at keeping hers; the mobile scoreboard came out a lot too, and Gili used it well. She was far ahead at one point, but she said you never know with this game which is true. We all caught up before the final scoring, and anyone could have won depending on what happened with the castillo, though I only had one in there, which I did use for 2 points. When I got the king before the first scoring I was down caballeros so couldn’t take full advantage. 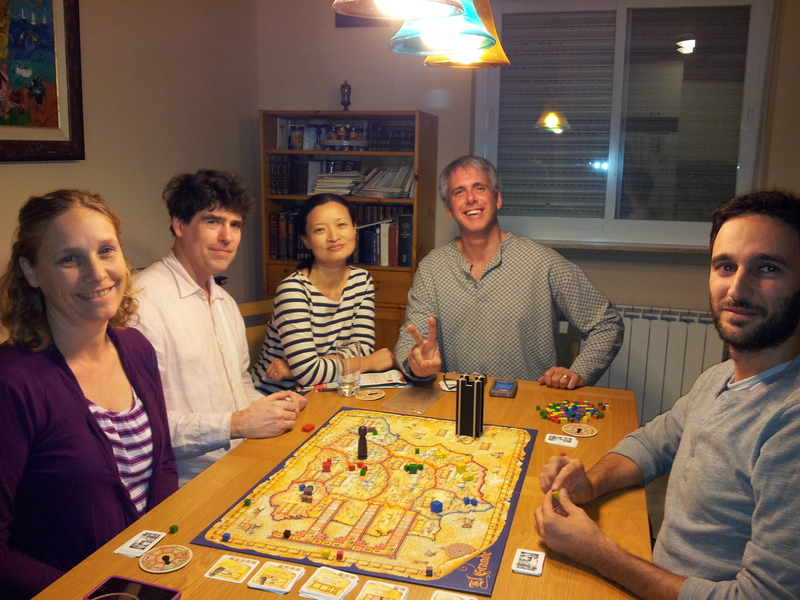 Shalom did a good job strategically, taking over Seville and then moving the high scoreboard from where Gili had it. Roie did very well for his first game, and had an out of the way starting region. 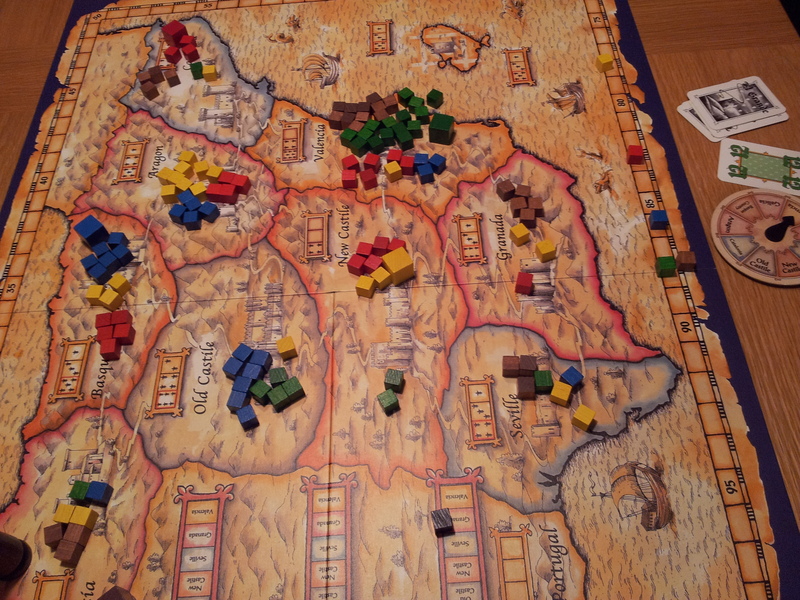 Gili had New Castille and lost it, I had New Castille and managed to hang on to the majority for scoring, at a high cost, but I was able to score it on the one for the most caballeros. Eszter gained the most points in a round when she changed her mind and didn’t veto the vote for a region to score. She was also ahead in the castillo which we scored at least twice. I had around 3 cubes in the castillo the whole game. It was a fun, with an exciting close finish. Gili and I wanted to get in a game together. We played Caverna, a new game – a souped up version of Agricola, which Gili doesn’t like. But this version has caverns and mines and rubies, and somewhat simplified feeding requirements. 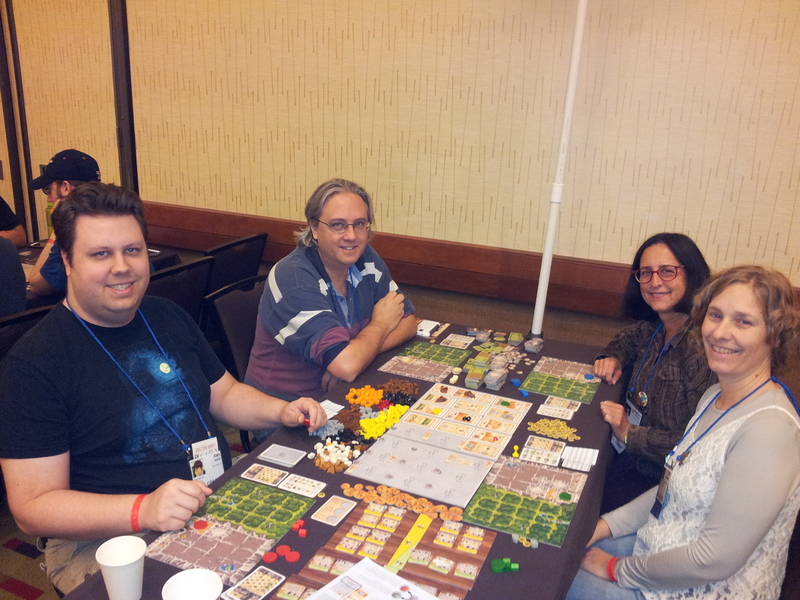 It felt like Agricola to me as far as planning went, though more fun with the new items. It has fancy meeples which don’t justify the $90 price. I managed to get a lot of rubies and a ruby multiplier, the winner had 83 and I had 82. We all had a lot of animals and farming, I had fewer mines. It’s a nice game, no cards, there are buildings and it feels like more options overall. Gili narrated a quick video in Hebrew. 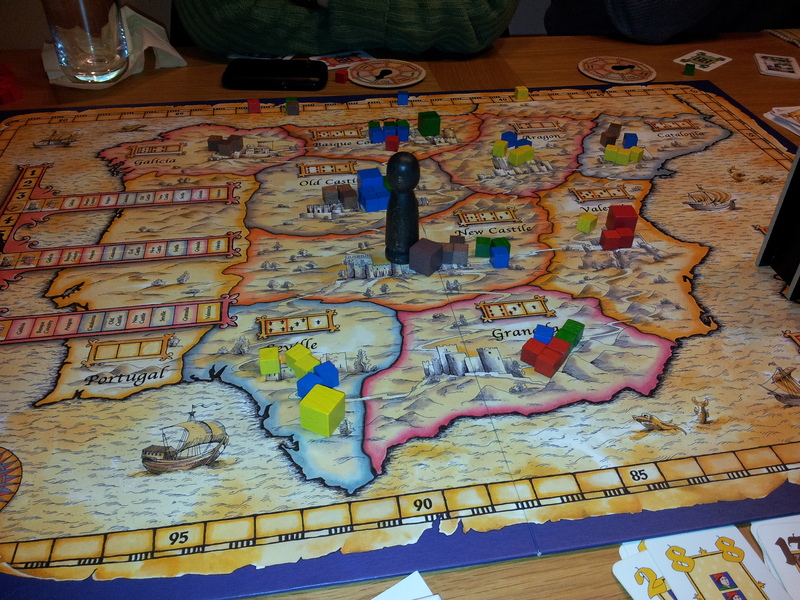 I got El Grande in the library and had one person ready to learn it. We waited for more players; I went over to see if Amanda and Daniel were interested, they agreed, another game they hadn’t played. While organizing the game with them of course people came by who wanted to join, but only if we could take two which we couldn’t. They did ask here and there about the King’s region, but not every turn. At the second scoring Amanda castillo’d into the King’s region; we let her redo it because no one else had turned over their spinners. Daniel was off taking a call so he didn’t see it. End of game he castillo’d into the King’s region, and we had all turned over our spinners so he lost out. Amanda tied me at a bit over 100. Daniel attacked me directly which hurt him but helped Amanda. Ten Plagues: Let My People Go! I ate and rested before the publisher designer speed dating meet-up. 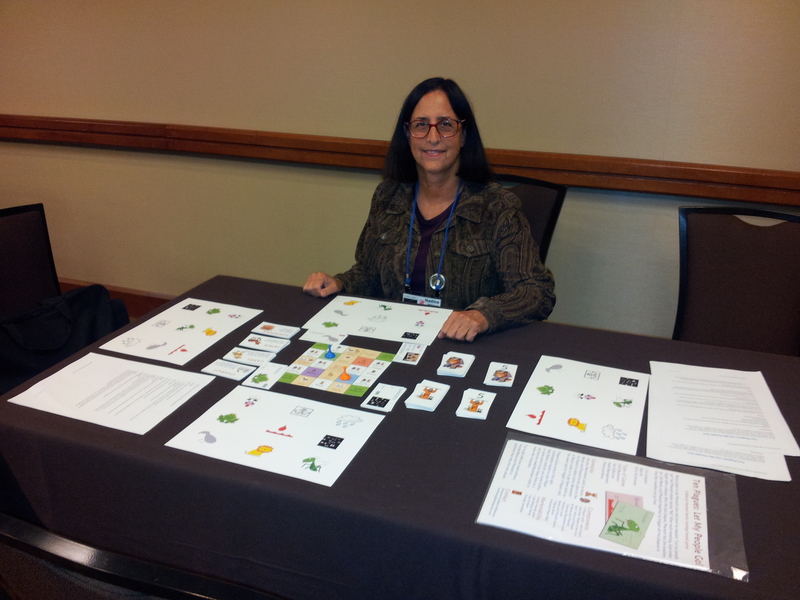 I was really tired and jet-lagged, I went down early to set up. James Mathe did a great job organizing the whole thing, for 2 sessions on 3 nights. I had printed out the schedule and gave it to him when he didn’t have his. It was fun but hectic to have 6 minutes with all these publishers. None of whom are interested in biblical themes games, as I expected. They commented a bit on the mechanics. At first they were willing to take turns playing, but later they were burned out and I just explained. One of the games on the list which sounded interesting was Dabbawalla: The Mumbai Lunch Delivery Game. Most of the games were listed as medium to light. I didn’t play Little Prince but people said it was a good game. I played Dungeon Dice. 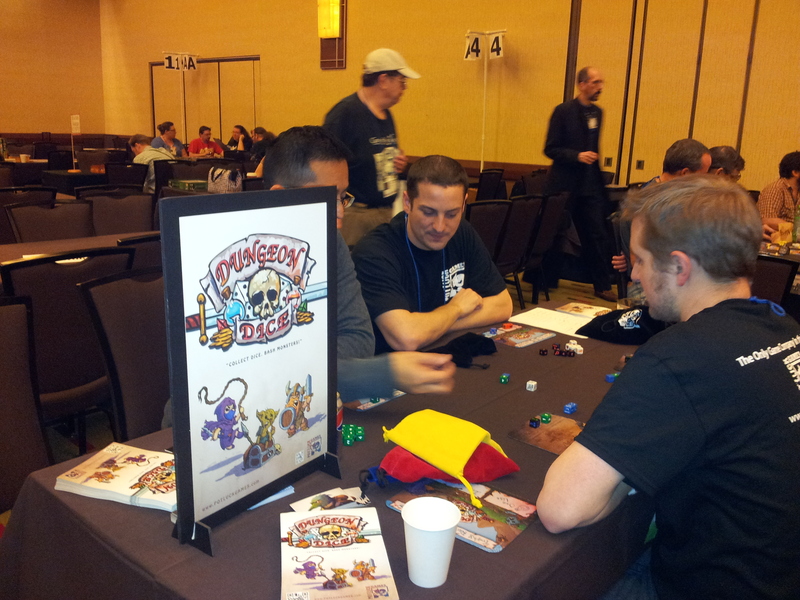 It’s a fun game with over 80 different custom dice, it was a vendor demo so I got a die at the end. It’s quick combat with different dice characters and a clear goal of 3 gold dice. Cliff and kids would like it. Walking around later there was a game of Goa starting, they were reading the rules. I had played a lot years ago when we used to have the game, I remembered I wasn’t good at the auction. Which was still the case. It was fun to play, it’s a good game. Jon got rid of it because he didn’t like the colony building mechanic. I lost twice at it at critical times, another player lost once, but then got the last colony so I couldn’t get it which set me back. After we finished the game we found that colony hiding in the box. 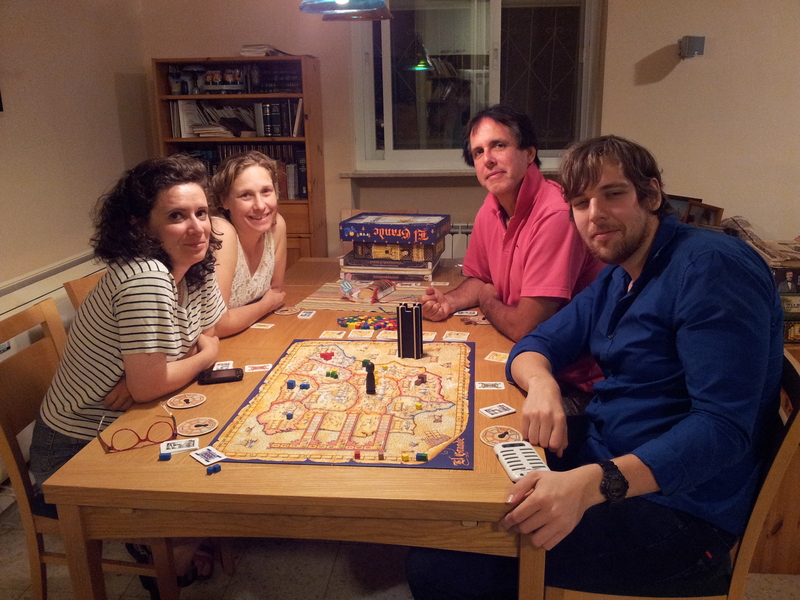 One of the players, Rael Dornfest, thought that his friend and I would like Sailing to India so we planned to meet in the morning to play it. 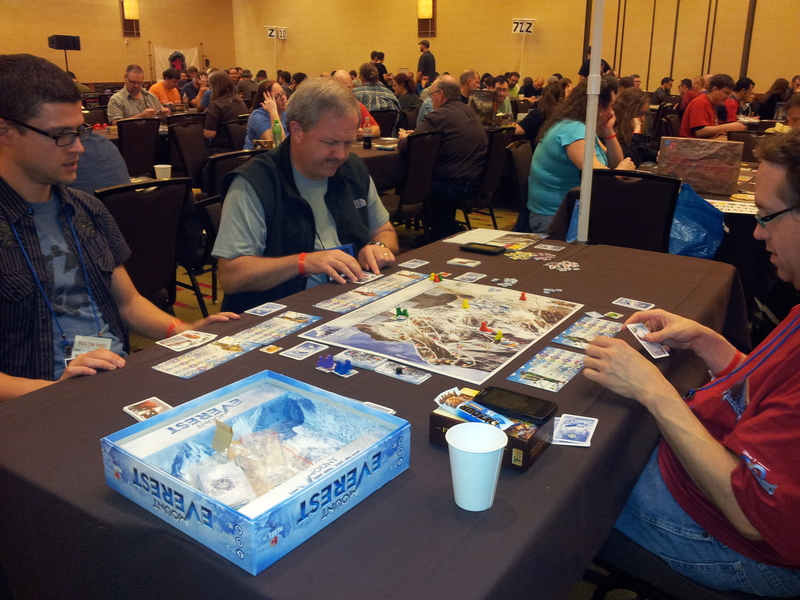 Everest game for Ginat who just finished hiking to the base camp with Adi. Ori is new to our group but not to games, he plays in various places 4 times a week. He blogs at http://israelimeeples.wordpress.com. We introduced this to Ori. We played the advanced game, but I just tried to fill my board as quickly as possible while the others tried for high scoring cards. No Villagers came up. Anyone who has played with our group understands the co-op reference. The game took almost 4 hours, long even for us. Every move engendered long discussions and analysis. First play for Ori. I used the 1 13 combo for the first scoring round, but I was last to play the first two turns, so didn’t have much on the board. Ori caught on well and was ahead towards the end, when he got attacked. Gili started off strong, but then was attacked. Mace, who complained that he didn’t get the game and wasn’t good at it, went last on the last turn, but got the King because people took scoring, scoreboard and intrigue. Counting the points was suspenseful, ending in a surprise tie, with Mace having moved up from far last place; before final scoring Ori was tied for first place with Eszter due to scoring cards. There was a knockout fight for Valencia at the end because it had the high scoreboard, Eszter, Mace and Ori Castilloed in. Mace – brown, Gili – yellow, Eszter – red, Nadine – blue, Ori – green.